Get the look for much, much cheaper. Meghan Markle has been a member of the Royal Family for just over 100 days and everyone's wondering how she's coping with the dramatic lifestyle shift. Unfortunately for the curious, the tight-lipped royals may never tell, so we can only speculate. 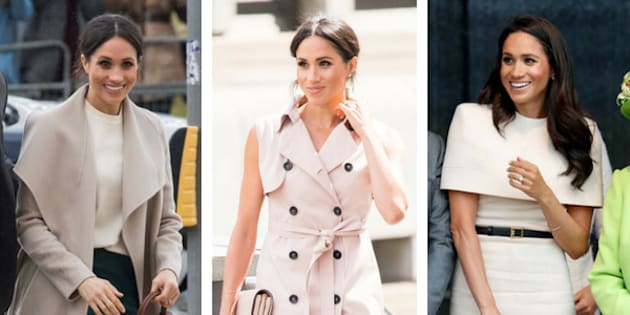 One thing the royals can't hide, though, is the Duchess of Sussex's striking style makeover. Before she reached duchess status, Markle was partial to distressed jeans, oversized shirts and large tote bags. Today, you're more likely to see her in structured dresses, accessorized with tiny clutches and closed-toe pumps. Meghan Markle's pre-royal style included oversized handbags. While style comparisons between Duchess Kate and Meghan were bound to happen, one thing she's done notably better than her sister-in-law is accessorize. You don't hear about Kate's accessorizing prowess nearly as much as you hear about Meghan's. Plus, the public is constantly buzzing about her stylish handbag choices. For us commoners, her aspirational purse collection may be slightly (way) out of reach, but that doesn't mean you can't channel her newly minted style. We've scoured the web for these handbag dupes that don't cost a royal fortune. Meghan Markle visits Nottingham Contemporary on Dec. 1, 2017. The Duchess of Sussex has been spotted carrying two purses from Scottish label Strathberry. Their structured bags are a far cry from Markle's pre-princess totes. Strathberry purses start at a lofty $465 for their mini bag, but that doesn't mean you can't get the look for less. This Urban Originals tote from Nordstrom has the same structured silhouette for a quarter of the price. Meghan Markle attends the Commonwealth Youth Forum in London on April 18, 2018. At a Commonwealth Youth Forum in April, Markle effectively saved Australian company Oroton from bankruptcy, Harper's Bazaar reports. Teamed with an Altuzarra dress, the duchess accessorized with Oroton's two-toned Avalon crossbody bag. While the original purse is on the cheaper end of Markle's handbag collection, you can also get a similar look at a fast-fashion price with H&M's $34.99 shoulder bag. The Duchess of Sussex and the Queen at Mersey Gateway Bridge on June 14, 2018. One of the duchess' first outings as an official royal saw her toting around a wee Givenchy clutch. The reason for the royals' affinity for clutches is actually practical and slightly sneaky. If you're holding a clutch, you can avoid shaking hands with people, an etiquette expert told Business Insider. You, too, can avoid human interaction with this Aldo dupe. Meghan Markle and Prince Harry attend church with the Royal Family on Dec. 25 2017. Markle wasn't an official member of the Royal Family at this point, but her style certainly kept up with her well-heeled counterparts. For Christmas Day service, Markle accessorized with this unique round bag from Chloé. The circular style was already trending, but after the soon-to-be royal was spotted carrying a suede circle bag, it became a certifiable must-have. A wallet-friendly and equally chic dupe can be found at Aldo. Meghan Markle on the grounds of Cardiff Castle in Jan. 18, 2018. We're not surprised Markle started favouring British designers. The newly minted royal was spotted on her first visit to Wales carrying a bag from London-based DeMellier. She paired the forest green saddle style bag with an all-black outfit. You can do the same with this emerald dupe from Montreal-based company Matt & Nat for under $200. If you're not set on the forest green shade, Ever New also has a similar purse in powder pink. Meghan Markle meets members of the public in Belfast, Northern Ireland on March 23, 2018. Meghan has also been spotted carrying another Brit-born designer bag, this time by Charlotte Elizabeth. The bag is sleek and modern and (unfortunately) carries a hefty price tag. Alternatively, you can get a similar minimalist handle bag from The Cambridge Satchel Company for under $200. The Duke and Duchess of Sussex at the Sentebale Polo on July 26, 2018. Even royals take it down a notch occasionally and wear items even us commoners can afford. The duchess was recently captured attending a charity polo match with an $80 J. Crew clutch in tow. Fortunately, Amazon has made anything possible, selling an eerily similar version for half the price. Meghan Markle and Prince Harry at the Queen's birthday concert at Royal Albert Hall on April 21, 2018. Even before she became an official royal, Markle had already swapped large totes for clutches. She attended the Queen's 92nd birthday concert carrying an elegant gold Naeem Khan clutch (worth roughly $1,960) that contrasted beautifully with her navy cape dress. For a similar textured effect that's much friendlier on the wallet, we love this Like Dreams Macie Evening clutch. The Duchess of Sussex visiting The Nelson Mandela Centenary Exhibition in London on July 17, 2018. Canadians rejoiced when the duchess was photographed in Canadian designer, House of Nonie. This time, her pale pink clutch flew under the radar, but make no mistake, it was definitely still noticed. Her Mulberry Clifton Bag retails for well over a $1,000, but you can get the same look with this Michael Kors doppelganger for just under $200. Meghan Markle attends a reception for Women's Empowerment in London on April 19, 2018. Markle has been seen carrying the Gucci Dionysus micro clutch on several occasions. Retailing for over a $1,000, the tiny designer bag isn't the best investment, but if you want to get the look for much, much less, ASOS offers this equally impractical but very pretty velvet dupe for $30.